RT @megganellingboe: RT @webertom1 NOTE: We'll have special programming at noon on @MPRnews on #Duluthflood, hosted by @cathywurzer. While most of Minnesota is very wet there are large pockets, SE Mn that are crying for rain. Hard to believe when we see what is happening in the rest of the state. Statement on Facebook from the Lake Superior Zoo: "Thank you to all of our friends and zoo family for your support. What has happened at the zoo is extremely traumatic for our staff and animals. Our hearts are broken and we very much appreciate your kindness and compassion. It is our priority to keep you all appraised of the latest developments. We ask for your patience and continued support. We assure you we are continually working to maintain the safety and well-being of our beloved animals." DLH: Esko [Carlton Co, MN] FLOOD at 11:35 AM CDT -- the midway river is flooding onto midway road...road is being washed out at this time. 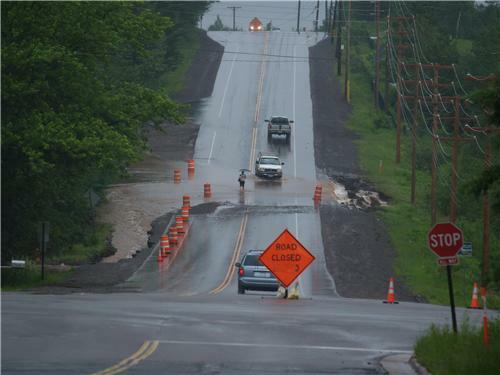 Photo from Doug Frisk of Glenwood above Jean Duluth Road: "The shoulder has collapsed and the road is subsiding." Photo of the St. Louis River with the Thomson dam in the background from the Homeland Security Emergency Management Facebook page. 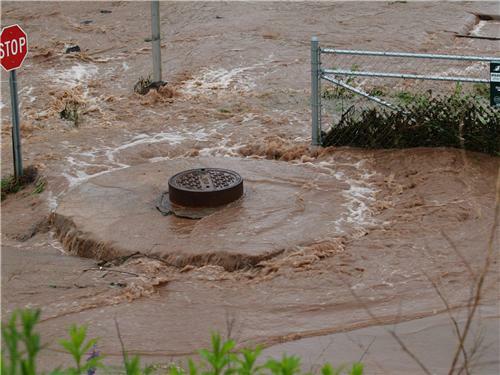 Paul Huttner says we're still getting reports of flash flooding in and around Duluth. Paul Huttner: St. Louis River is within a foot of its record high level set 62 years ago. Duluth police are finishing up evacuating the last of 40-50 houses. Still no reports of injuries. RT @webertom1: Jim Hansen w/ Duluth PD just noted on @DailyCircuit that there are still no reports of injuries from #Duluthflood. 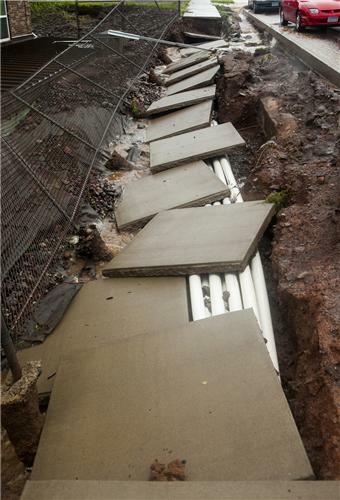 Photo from MPR News photographer Derek Montgomery: Brewery Creek burst through a retaining wall adjacent to the Whole Foods coop Wednesday morning after heavy rains caused flooding in Duluth, Minn.
Another photo from MPR News photographer Derek Montgomery of a collapsed sidewalk in Duluth. 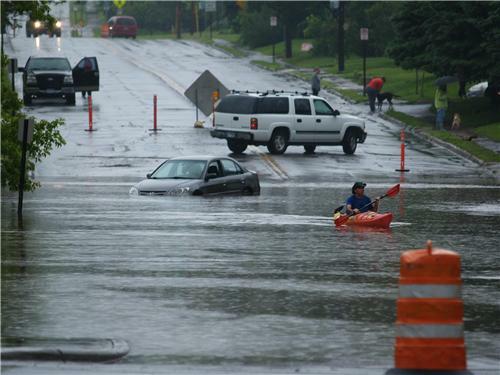 Minnesota residents in parts of northeastern Minnesota hit by flooding can take steps to safeguard their health, state health officials said. 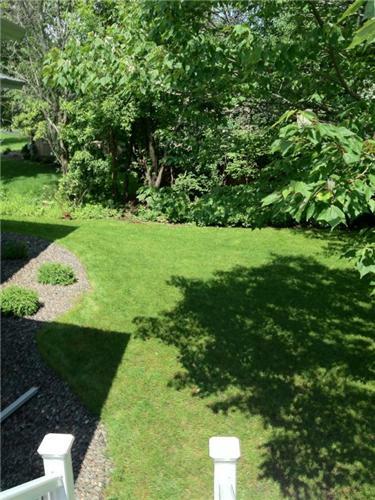 People should assume their private well is contaminated if the well casing was under water. Well water should not be used for drinking or cooking until the well and distribution system are flushed out, disinfected and tested for contamination. Meanwhile, they should use bottled water for drinking and cooking. If flood water came within 50 feet of the well, but the well was not under water, you may still want to have your water tested as a precaution. However, you do not need to disinfect your well before having it tested. Never use generators, grills, or other gasoline-, propane-, or charcoal-burning devices indoors, inside your home, garage, carport; or near doors, windows, or vents. These items produce carbon monoxide, an odorless, colorless gas that kills more than 500 Americans each year. Don't let them play in or near floodwater or in areas that have flooded recently. Wash your child's hands frequently with clean water, especially before meals. Discard any soft toys that may be contaminated with sewage. Young children may put these items into their mouths. Disinfect other toys that may be contaminated by washing them with a solution of two teaspoons bleach in one gallon of water. Keep refrigerator and freezer doors closed as much as possible to maintain the cold temperature. Refrigerators will keep food cold for about four hours when left unopened. A full freezer will hold the temperature for approximately 48 hours (24 hours if it is half full) if the door remains closed. If the food stored in the refrigerator has been held above 41 degrees F for more than four hours, throw it away. If food stored in the freezer has thawed but is still below 41 F, it can be refrozen. Although the quality of the food may be compromised, it should remain safe to eat. Commercially canned foods in good condition are safe if you remove the labels. Wash sealed cans with warm water and detergent, and then disinfect them using a solution of one tablespoon of bleach to one gallon of clean water. Re–label the cans so you know what is inside. Destroy canned goods if the can surface is badly rusted or pitted, swollen or leaking, or badly creased or dented at the rims or seams. Rigid plastic containers without a screw top are safe if they are have not been damaged, the container has not been submerged in water or other liquids, any soil on the container can be removed, and the closure has no soil, rust or dents. Foods that are packaged in paper, boxes, containers with screw-top lids, or other non-water-proof pages are not safe if they have come in contact with flood water. Throw them away. Floodwater may be contaminated, but it is unlikely that simple skin contact — even with raw sewage — will make you sick. Generally, you must swallow floodwater, or something that’s been contaminated with floodwater, to get sick. Wash your hands with clean water before you eat, drink or put anything in your mouth. There is currently no reason to believe that area residents face an increased risk of a disease outbreak. However, state and local public health officials are monitoring carefully for any cases of infectious illness that might be connected with the flooding to ensure that they respond quickly in the event of an outbreak. Public health officials routinely recommend getting a tetanus shot every 10 years. The flooding is not a reason to get one right now or to get shots for typhoid, polio or any other vaccine–preventable disease. However, people who get puncture wounds should talk to their physicians if they have not had a tetanus shot within the last five years, no matter where or how they got hurt. For more flood–related information, visit the MDH website at: www.health.state.mn.us/divs/eh/emergency/natural/floods/index.html. Reporter Jess Mador: St. Louis County Sheriff's Office reported that an 8 year-old boy was swept underground through the sewer system and resurfaced after six blocks with only scrapes and bruises. 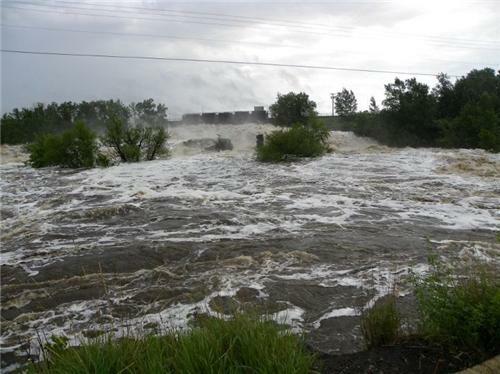 Reporter Jess Mador: 250 homes have been evacuated. List of road closures from MnDOT is long and growing. Parts of I-35, Hwy 23 and 210. DNR has closed Moose Lake, Jay Cooke and Savanna Portage State Parks. Paul Huttner says rainfall over the last 24 hours has been historic. Reporter Jess Mador: Duluth officials held a press conference at 2:00pm saying they're still trying to assess damage and the conditions of roadways. They plan to seek federal disaster relief assistance. 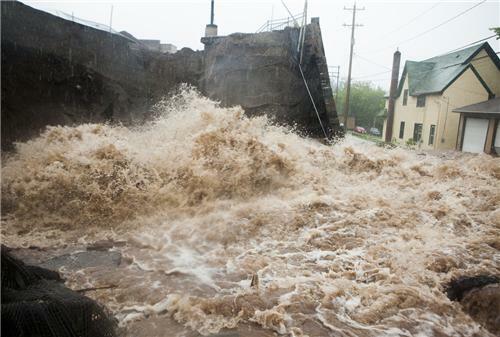 RT @CarolynKirsch: I was 7 in 1972 when there was a #duluthflood, I think this time was a lot worse. Glad my daughter is safe and sound. Photographer Derek Montgomery: Most dramatic flooding that I saw today was the retaining wall that was blown out by Brewery Creek behind Whole Foods Coop. 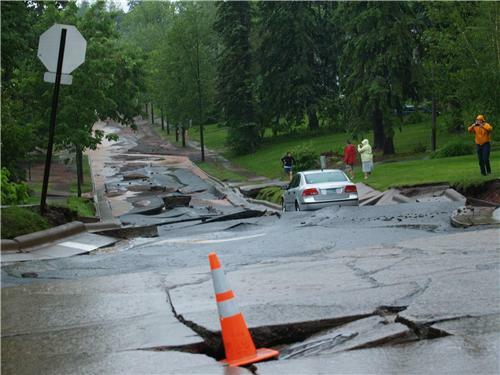 Photographer Derek Montgomery: Sinkholes are all over Duluth. The most dramatic one was the one on Skyline near 9th Ave. E., 25 feet deep, 10-15 feet wide. It's miraculous that the passengers in the car that fell into it were not hurt. Photographer Derek Montgomery: A lot of people are talking about the storm of 1972 today. A lot of students are out of school, not going to work, so a lot of people are out with their cameras checking out what's happened. No one's seen this type of damage in the city for a long time. See Derek Montgomery's photos for MPR News here. Try again. Anyone know where the pic of the washed out Railroad crossing is from? Is it below the zoo? The culvert there was really small causing the zoo to flood in the past. Numerous road shoulders are also washed out due to flooding. Conditions are changing rapidly and all roads will remain closed until further notice. Travel is not advised due to flooding until conditions improve and MnDOT crews can make progress to recover roadways. Motorists should plan accordingly. When a road is closed it is illegal to travel in that area. Motorists can be fined up to $1,000 and/or 90 days in jail. In addition, if travelers need to be rescued from a closed road, other expenses and penalties will apply. CenturyLink says 911 is back up and working along the North Shore.